Simple understated design for a classic look. Ideal for hanging any hanging basket. Suitable for use against any wall or fence. Steel construction and finished in black rubber for weather/rust protection. Supplied as a pair of 30cm (12") wall baskets, ready to hang. Screws etc. not included. 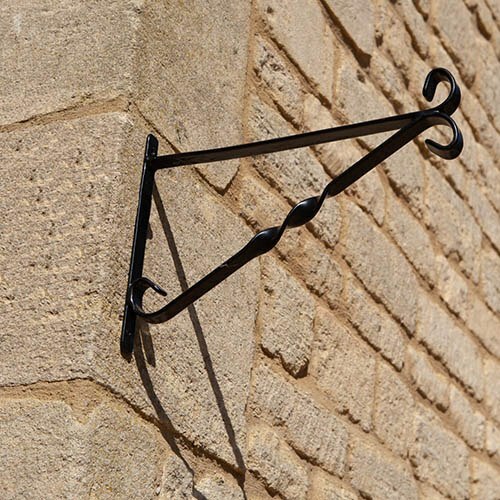 Two strong and durable steel wall brackets to hang your baskets up. Each one is finished in black-rubber, making them weather proof, and meaning they won't rust. The understated, classic design will complement any baskets perfectly, for a simple yet classic look wherever you hang them. Supplied as a pair of 30cm (12') wall baskets, ready to hang. Steel construction with black rubber coating for weather protection. Screws etc. not included.